MISS VANESSA "FUNKY CROW DOLL"
made to order from my Etsy Shoppe!! This lil Cutie Pie was a sweet Mother's Day Gift!! click on the link below to get to my Etsy Shoppe to order one just for you!! We Have our New "HAMM HOCKS" available!! No Animals were hurt in this process!! Also available are our new "PICKLED PIGGS FEET"
with no animals hurt in the process!! You can see a lot of what I have been up to on my Instagram. Link on the side. Stop by n see what else I have been up to!! AND I say to myself what a wonderful world!!! DESIGNED AS A "CHIMNEY SWEEPER"
WITH A FRIENDLY "PIGG SNOW DUDE"
Available in my Etsy Shoppe!!! 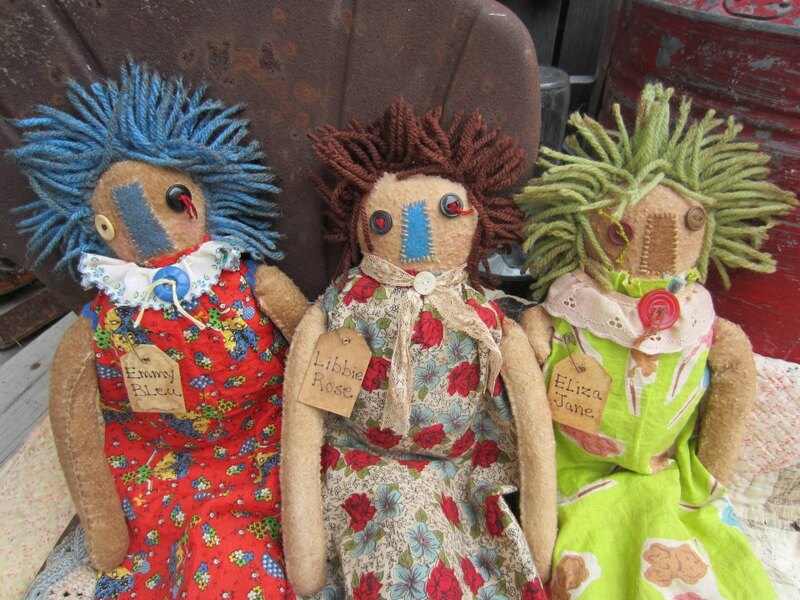 Newly Designed "LIL FOLK" dolls by me!! These are like my KIN FOLK" dolls the LIL BABY doll is designed after my little Grannie Girl!! Set of Six "GRUBBY CORN" available in my Etsy Shoppe!! UPCYCLED PUMPKINS made by me and also available in my ETSY SHOPPE!!! Oh what a crazy summer!! To much heat n humidity for me!! I have been trying to create as much I can!! Looking forward to some Craft Markets coming up!! Hope you guys are doing great!!! Well I know I have been missing in action but I have been creating!! This has been a rotten Winter here! We have all been sick on n off!! You know that sharing thing that happens with families!! Well I think we have gone a bit overboard on it!! This is a jazzy MOUSE MAKE DO I created on an old metal funnel. The Michigan Sun is shining in this picture so it might be a bit hard to see but it turned out really cool!! But I LOVE that Sun shining!!! Available in my ETSY SHOPPE!! This lil PIGG was a special order for a sweet lady!! I added an egg n chick to her. Jazzed her up a bit!! She's available MADE TO ORDER in my ETSY SHOPPE!! This is a new PIGG in a Rusty Spring with a lil chick and hand sewn eggs!! I had a blast putting her together!! She's available in my ETSY SHOPPE too!! At least I can create while I hang out in my bed!! Ha Ha!! Time sure flies by. I am looking forward to getting out in the yard and do some gardening. We had a quiet night at home. Well the neighbors did light a few fire works! We ate at Arby's for dinner using some cool coupons I had and best part no dishes!! Plus we saved some money. Something I always like to work on. I think I have decided what my word for 2016 is gonna be!! Last night when I watched the ball come down I saw the word "priceless" on a building and it just keeps sticking in my head!! But I have been thinking life is "priceless" people are "priceless" n the gifts God gives us are "priceless" n Love is "priceless". I think like everyone I have been a bit gone from my blogging!! Sometimes the business of life gets in the way n I take the short cuts through social media. I miss the blogs but I also have a problem reading blogs with all the advertisements on them. My computer takes for ever to load up n I get impatient. Ha just realized my time is also "priceless". I have been working on some new things in my etsy shoppe. I started a new section called "JUNQUE YARD RESCUES". Can ya digg it? I just love it and also making the new rescues for it!! Here are just a few. "Peggy" SOLD right away. My dogg "Frankie Ray" is still available. FRANKIE RAY still available from this link. Up cycled from an old vintage coat and put onto a old rusty spring. I also added a vintage dog license from Michigan and a piece of real rusty chain link. Peggy is made from an old gas can nozzle with other rusty parts and a quilt piece dress. She's really cool. Well just wanted to stop in n say hey!!! I am working on some special orders which is very cool. I love it n keeps me crazy busy but in a good way!! Hope you are all doing good. Thanks for stopping by!! "PRICELESS"> extremely valuable or important!!! Hi guys!! I am a Funky Farm House lovin kinda gal! I am also an up cycle artist who loves taking rusty and vintage junque and making it into cool and unique items. I hand sew all my creations. I love estate, yard, garage, church sales, and thrift stores!! I also gather rusty junque and nature things on my walks or in my yard. I have my own style and my family and friends call it Fran-Style!! My favorite colors are orange and brown. I drive a orange car. I drink a lot of coffee and I also use it to grubby up my creations. I am blonde and flighty and it has followed me all of my life!! It may take me a minute to get things!! But I eventually do!! Laughing at myself is one of my favorite things to do besides creating!! I call our home "The Funky Farmhouse" cuz believe me it can get alittle bit funky and wild n crazy around here!! I am married to my best friend Sim. I love making new friends here on my blog with kindred spirits!! Thanks for stoppin by my lil corner of the world!! XOXO Love ya Fran.